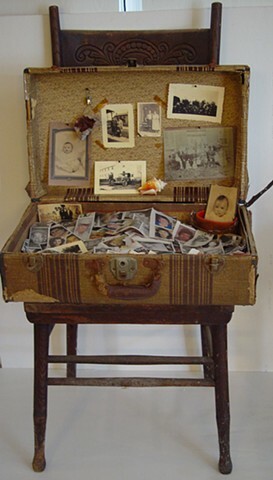 Mixed Media: found suitcase, newspaper obituary photos, scanned photos, camera case, dried leaf, shell, map pins, hanging clip, garage dust and dirt. 17 1/2 x 20 x 1/2 x 16 1/2"
and Lead for Communications and Humanities, Texas State Technical College, Harlingen, TX. Memento Mori literally means, “remember that you will die.” Just as the seasons turn from spring to summer to autumn to winter, the cycle of life moves from birth to life to death. As in the 17th and 18th century Dutch paintings, empty shells remind us that we are mortal, that life is fleeting, and that we will all die. Obituary notice photographs show us the physical changes wreaked by time and foretell the ultimate conclusion of the life cycle. I was particularly struck by the obituary inclusion of a deceased newborn’s foot print…a footprint in the sands of an all too short a time.